Glucosamine and chondroitin sulphate are both essential for maintaining healthy cartilage, the smooth tissue that lines the surfaces of bones and joints. There are no edible food sources of glucosamine, so when our bodies fail to manufacture sufficient natural glucosamine, supplementation is useful to help maintain joint mobility. Can be taken to protect and preserve existing joint health. Aids in easing symptoms associated with poor joint health. 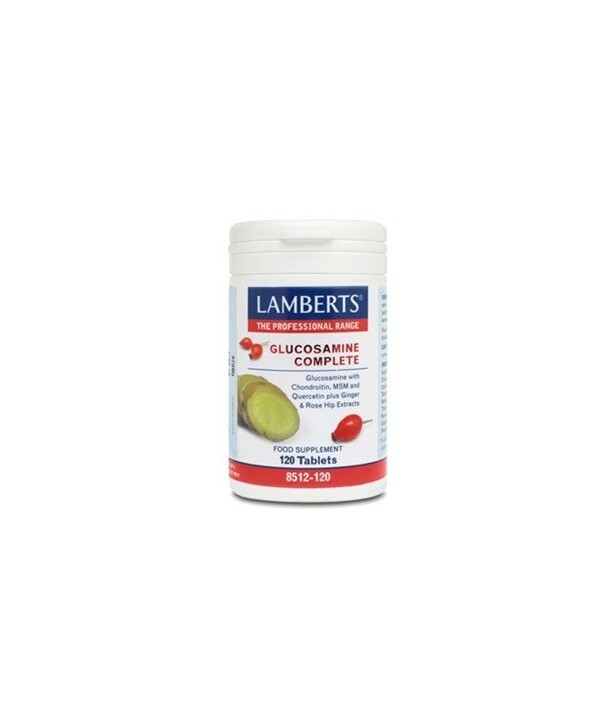 Lamberts Glucosamine Complete is a high strength, unique fusion of some of the most important ingredients useful for joint care and maintaining their health. Each ingredient has been selected based on their different but complimentary functions. Glucosamine Sulphate: The highest grade used in this formula is very close to the profile of naturally occurring glucosamine created by the human body. An important component of joint cartilage. Chondroitin Sulphate: An important component of cartilage. It is thought to attract fluid into the cartilage to enhance elasticity. Quercetin: A potent bioflavonoid found in several different fruits; especially apples. Many human studies have reflected its importance in joint health. Ginger: A very high strength extract providing a warming effect on the capillaries which helps to keep blood flow at its optimum around our joints. Rose Hip: An extract very rich in vitamin C and have been treasured by traditional herbalists for centuries. They help with blood flow around joints by strengthening the capillary walls. MSM: A key component of cartilage and plays an important role in joint health, seen by many practitioners as the perfect partner to glucosamine. Small quantities of MSM occur naturally in many foods. Three Lamberts Glucosamine Complete tablets provide the full 1500mg of glucosamine sulphate, the level used in many studies, as well as 300mg of chondroitin sulphate*, a necessary nutrient for maintaining joint health and 150mg of MSM, (methylsulphonylmethane), per daily dose. The powerful bioflavonoid quercetin, has been included at a potent 60mg, plus 1200mg of ginger (as a concentrated extract), as well as a 400mg of rose hip extract. *It is worth noting that a common practice with chondroitin supplements is to use preparations that are just 20% chondroitin, but the label may declare this as if it is 100% chondroitin. Therefore a supplement declared to as '400mg chondroitin Sulphate' is often just 80mg of chondroitin Sulphate. 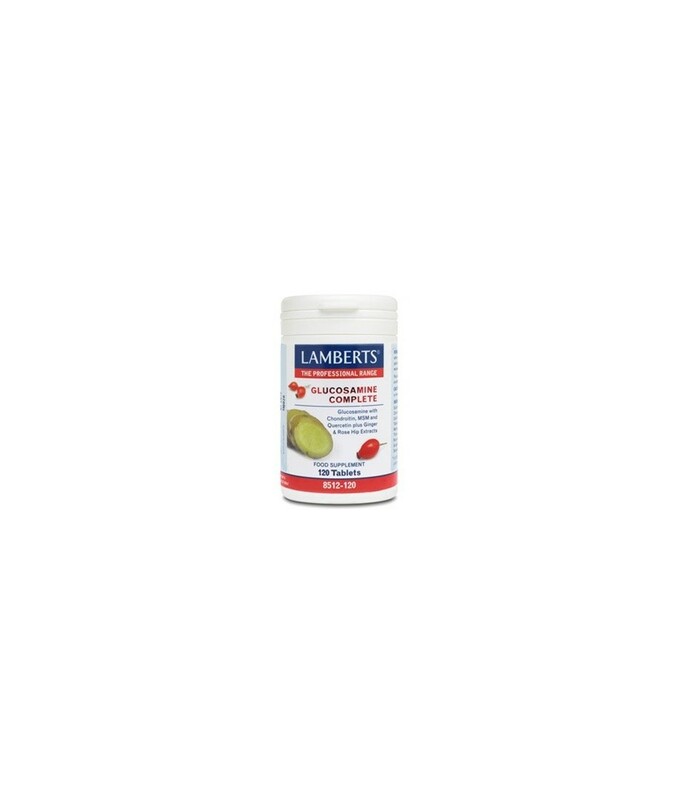 However, Lamberts supplement provides 330mg of a 90% chondroitin preparation to provide 330mg of pure marine chondroitin (per 3 tablets). Glucosmaine Sulphate 2KCI is a pure compound derived from shellfish. Lamberts Glucosamine Complete is not recommended for pregnant or lactating women. Glucosamine Sulphate 2KCI 2000mg (Providing: Glucosamine Sulphate 1500mg), Chondroitin Sulphate 300mg, MSM (Methylsulphonylmethane) 150mg, Quercetin 60mg, Ginger (from 60mg of a 20:1 extract) 1200mg, Rose Hip (from 100mg of a 4:1 extract) 400mg. Tableted with: Modified Starch, Cellulose, Tablet Coating (Colour: Titanium Dioxide, Glycerin), Silicon Dioxide, Stearic Acid, Magnesium Stearate.